(NaturalNews) Ex-smokers and others looking to give their lungs a natural health boost can find help in a surprising place: the sweet potato. And the healthful qualities of this remarkable vegetable don't end at the lungs: They extend to various types of cancer, and to a wide range of other health benefits. Sweet potatoes (Ipomoea batatas) have been consumed by human beings for thousands of years. There are more than 8,000 varieties, ranging in color from white to purple — though yellow and orange varieties are most common, and are the types most strongly linked to lung health. Although people in the United States typically eat only the tuber of the plant, its leaves, roots and vines are also edible and cancer-fighting. Eat more sweet potato... leaves! Research into the effects of sweet potatoes on your lungs centers on the plant's high concentration of beta-carotene, which your body converts into vitamin A. This vitamin plays many important roles in the body, including in the health of the eyes, bones and immune system. Among other things, vitamin A and other carotenoids have been shown to aid in lung regeneration, including in people with emphysema. Another study, conducted by Taiwanese researchers and published in the Asia Pacific Journal of Clinical Nutrition in 2007, gave food frequency questionnaires to 301 people with lung cancer, along with 602 hospital controls and 602 neighborhood controls. They found that people who ate the most sweet potato leaves were 43 to 65 percent less likely to develop lung cancer than those who ate the least. The study also found that those who had higher intakes of vitamin A, alpha-carotene or beta-carotene had a significantly lower risk of lung cancer. Overall vegetable intake was also associated with lower risk, although sweet potato leaves and garland chrysanthemum had the strongest effect. But the cancer-fighting benefits of sweet potatoes don't end there. Studies have shown that sweet potato extracts may reduce breast cancer tumor growth and inhibit leukemia cell growth; that the antioxidant anthocyanin (found in sweet potatoes and in red, blue and purple fruits and vegetables) reduces liver cancer tumor growth in mice; and that sweet potato intake may reduce the risk of gallbladder cancer in human beings. Another study found that while high intake of three to four separate varieties of starchy roots and tubers — including sweet potatoes, potatoes and taro root — had no effect on rates of kidney disease, it did significantly reduce death rates from the disease. It may not be just carotenoids that are responsible for these benefits. Sweet potatoes are also high in the antioxidant polyphenols caffeic acid, dicaffeoylquinic acid and tricaffeoylquinic acid, which may also have cancer-fighting effects. Sweet potatoes are also high in complex carbohydrates, fiber, vitamin C, riboflavoin, magnesium, manganese, potassium, calcium and iron. Their complex sugars make sweet potatoes an ideal food for diabetics and others who struggle with blood sugar levels, while their high fiber content may aid digestion and fight colon cancer. Among vegetables, they are high in vitamin D, which plays a critical role in the functioning of the immune system. High levels of potassium and vitamin B6, along with fiber, make sweet potatoes a great food for your heart. Vitamin B6 also helps prevent strokes and degenerative diseases. 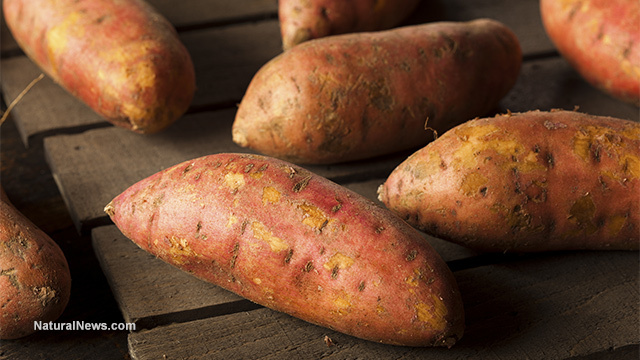 The beta-carotene in sweet potatoes also promotes healthy hair growth and prevents hair damage. You can even get another use out of the water you use to boil sweet potatoes: You can use it as a wash or bath to cleanse pores, remove toxins and soothe irritated skin.